» Mayday! It’s a May update! We’re Doomed! Mayday! It’s a May update! We’re Doomed! It’s been a fun month in Tin Man Towers (which incidently resemble a certain Yaztromo’s Tower) as we’ve been putting the finishing touches to The Forest of Doom, our third Fighting Fantasy release based on Ian Livingstone’s classic gamebook from 1983. This is a gamebook close to our hearts as for many of us it set in motion not only our love affair for gamebooks, but a love affair for fantasy based RPGs and the fantasy genre in general. Our heart’s have been warmed to see all the messages from nostalgic FF fans really looking forward to reading this again and also feel that this book was a precursor to bigger things in their lives. For many of us growing up in the 80s, The Lord of the Rings was an unwieldy tome that we desperately wanted to read, yet struggled to do. The Fighting Fantasy series bridged that gap and helped us get a fantasy fix of sword and sorcery all packaged up in a readable form that also doubled as a game – a winning combination! We’ve really been keen to keep the gamebook as faithful as possible and while we may approach some of the other FF titles slightly differently, we wanted The Forest of Doom to really tick that nostalgic box for readers. For that reason we have gone with Iain McCaig’s iconic cover of the Shape Changer, bringing it to life for the main menu and including all the original artwork and sticking closely to the overall structure of the story. 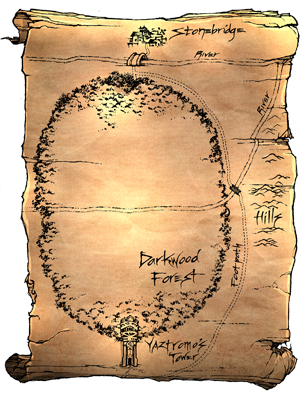 We’ve made a few changes, most notably the ending, which many eagle-eyed FF fans may spot and also added in a map, which automatically updates as you travel around Darkwood Forest. Ian Livingstone has also written a wonderful extra for the app that tells the story of how The Forest of Doom came to be! We released the app quietly to Google Play last week, which we like to do sometimes to build up early support. So far we’ve had a great response – lots of lovely 5 star reviews! The Forest of Doom will appear in the next couple of weeks on the Apple and Amazon App Stores. Tin Man Games envahit France! As many of our followers know, we having a special relationship with Studio 09 in France. They’ve been behind the French translations of GA1, GA2 and most recently Gamebook Adventures 7: Le Temple du Dieu Araignée on iOS. Over the last few months they’ve been helping us bring Le Manoir de l’Enfer (House of Hell) to iOS and Android using a licensed translation that we secured from Gallimard in France, publishers of Défis Fantastiques (Fighting Fantasy) as part of their Livres dont vous êtes le héros gamebook range. This is a great deal for us as Gallimard will help promoting our French FF apps in France too! Not only have Studio 09 been instrumental in translations and editing, but they’ve also been working hard on writing their own series of gamebooks that we are publishing over the next year or so. The first of these books is called Les Fils d’Uruzimé (Sons of Urizime) and as we did with TFOD above, we have had an early release on Google Play. You can find out more about the interactive Lovecraftian adventure here, and if you’re a French reader who owns an Android device then you get it from Google Play now! Le Manoir de l’Enfer will be appearing as a language choice in the next Android and iOS update. Les Fils d’Uruzimé will hit the iOS App Store in a few weeks and an English version will be available later this year. As you will have recently seen, we’ve teamed up with Black Chicken Studios in San Diego in bringing their upcoming gamebook, Holdfast, to digital devices. This deal was dependent on them reaching their goal on Kickstarter – they were asking to raise $20k USD – and we are really pleased to see that they not only crossed that threshold, but smashed it by over $10k! Congratulations to them and we look forward to working with the team later on this year in realising their amazing gamebook on iOS and Android. 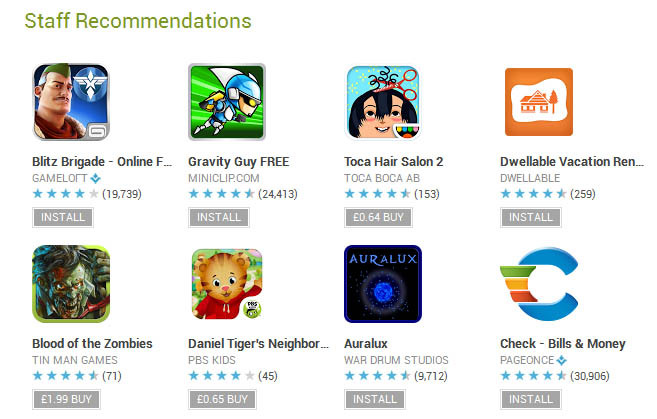 Blood of the Zombies featured on Google Play! We’re chuffed to bits with this. As you may know being featured means that we get visibility to a number of Android owners who may not have heard of Tin Man Games, Fighting Fantasy or even digital gamebooks before. To celebrate we’ve halved the price of both Blood of the Zombies and House of Hell for a week! We’ve got a number of titles currently underway. Our next Fighting Fantasy title will be Steve Jackson’s superhero romp, Appointment with FEAR! We may have mentioned before working on Deathtrap Dungeon but we’ve decided for a number of reasons (we won’t go into them right now) that we’re going to hold off from fully developing that title until later this year or in early 2014. We’ll let you know more information on that when we have it! Next up is our first fantasy Gamebook Adventures title in more than a year (can you believe that? ), currently titled Assassin 2. We’re about 70% complete and will be talking more about that soon! In fact we may need YOUR help in finding a good title for it – watch this space. Gary Chalk’s Gun Dogs and Strange Loves 2: Hex Boyfriends are also on the development slab and motoring along at full speed. Finally, we’ve also got Infinite Universe coming to Android too in the next few months.